MANILA, Philippines - (UPDATED) Nonito Donaire Jr was the guest of honor of the Greg Secker Foundation as they turned over 100 houses to typhoon victims in Iloilo. In a Facebook post, the boxing champ shared that he and his wife flew to Iloilo this week from Las Vegas. Donaire Jr had always aspired to make a difference and encouraged other athletes to do so. When typhoon Yolanda hit the country in 2013, Iloilo was one of the severely devastated areas. A lot of people lost their loved ones, homes, properties and livelihood. Two years after Yolanda, English philanthropist Greg Secker saw the need to help in the rebuilding of Iloilo. He founded the Build a House, Build a Home project in Iloilo. Donaire shared that he feels honored to be part of such a life-changing event. He said, “Honoured to be invited as a guest yesterday to the opening ceremony of the Greg Secker Foundation village in Iloilo. A great initiative from Greg Secker that will help 100's of families rebuild their lives." This is not the first time that the former boxing champion had done something good for the typhoon victims. Back in 2009 at the start of his career, he donated P1 million to the victims of Typhoon Ondoy to help build houses. EDITOR'S NOTE: Originally titled "An inspiring athlete! 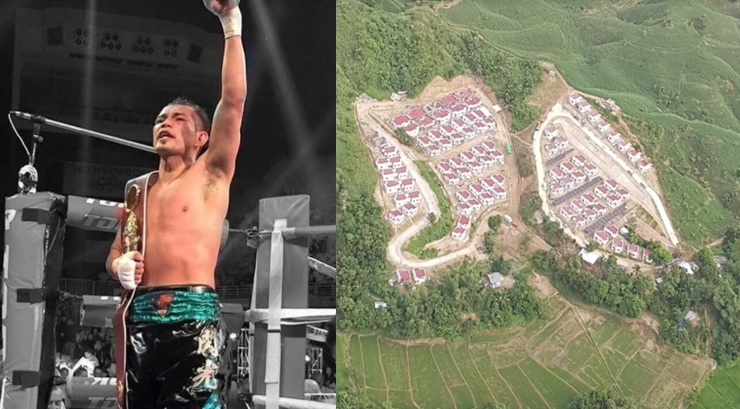 Nonito Donaire donates 100 houses to Yolanda victims in Iloilo," the article has been updated after the clarification made by Donaire's staff that Nonito himself did not donate the houses but served as the guest of honor during the turn-over ceremony.